When many people discuss buying more produce (fruits and veggies) the most common complaint is how expensive it is. How can they afford to pay that much for fresh produce and still feed their family?!? Well, I think it’s a myth. Based on my recent visit to the grocery store, the price of produce is actually pretty good. Let’s compare for a minute. A quick trip down the meat aisle will tell us that a chunk of meat of whatever shape or size will likely cost us about $3 a pound. And that’s the cheap stuff. No t-bones here. How about the other aisles. Hamburger helper? About $3. Plus a pound of hamburger, a cup or so of milk, and some margarine or butter. Chips? Doritos were on sale for about $2 a bag. I think that’s about a 10 ounce bag. Frozen Pizza? I saw some that were 5 for $10. Smaller ones, sure, but pizzas. Now, lets take a look at produce. Apples were $1.49 a pound. Oranges were $1.89 a pound. Potatoes were about $1 a pound. Onions were $1.38 a pound. Broccoli was about $2 a bunch. The list goes on. Sure, none of those, by themselves, is a meal. Very little of the first list is either. 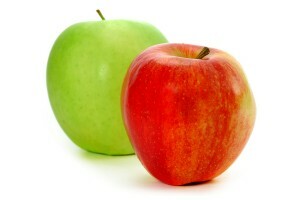 But, if you eat an apple before dinner or as an appetizer, it makes you fuller. Which means you’ll eat less of the other, more expensive stuff. Maybe you replace 4 ounces of steak with a 9 ounce apple. Even at a 2:1 ratio, you break even. If you manage to cut the meat even further back and replace it with other veggies, you’ll save even more! And I won’t even go into the savings on medical costs that could be gotten from eating more fruits and veggies. The bottom line is that expensive produce is a myth. It’s only when you don’t stop to consider that it’s replacing something else in a meal that you realize that. If you replace something, you can buy less of it at the store. And you will spend less. Sure, costs might stay the same, or even go up, if you don’t reduce what you buy based on your new eating habits. But, that food will last longer. Give it a try and then compare your budget sheets from before and after. I think you might be surprised by the outcome.